Have you ever wondered what goes on with your web host and your WordPress installation? Well, if you have wondered if there are server problems or security problems with the way WordPress has been installed on your host there is quick, free and easy way to check it out. Server Buddy is a free WordPress plugin that you can install and that will run simple server and WordPress security checks on your site. All you need to do is upload the plugin and activate it. Then go to the Server Buddy Menu. When you are in the menu you will see a screen just like the one above. Choose the type of test that you want to run from the drop down menu and click “Run Test”. 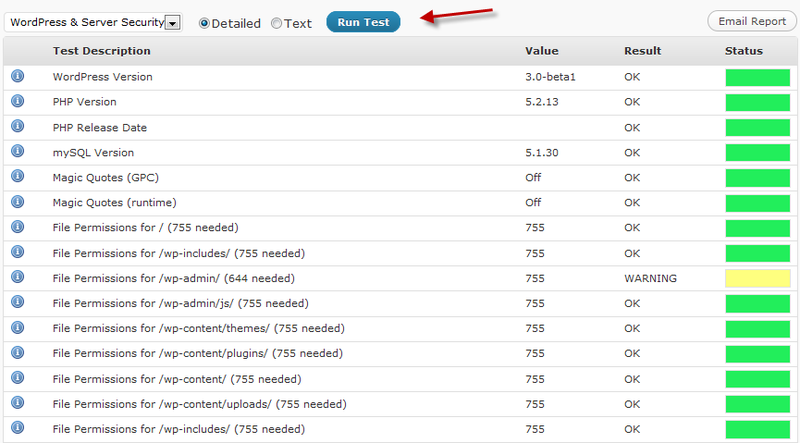 On my test site you will see that I am running WordPress 3.0 (beta). The plugin has quickly told me all the details of my server configuration the sql version and php version. It’s also picked up a problem with file permissions that need to be chmod to 644 so I’ll need to go to my install and change the file permissions there. This is fantastic information for people who are new to WordPress and don’t know how to find this information easily. It’s also great for theme and plugin developers. If you have a problem with a theme and plugin you can quickly run a test and send the report to the developer via email. This saves them going back and forth asking you for that information. If you are unsure of what the description means then you can click the handy information icon for more details. You can also check the server details for the site by running a General Server check. In addition, the plugin can run plugin compatability checks for Gravity Forms, Backup buddy and Pods CMS. All in all a handy little plugin that will be useful for WordPress users and developers. You can download it for free at Server Buddy.